UN report proves Iran has been shipping weapons to Yemen's Houthi rebels since at least 2009. 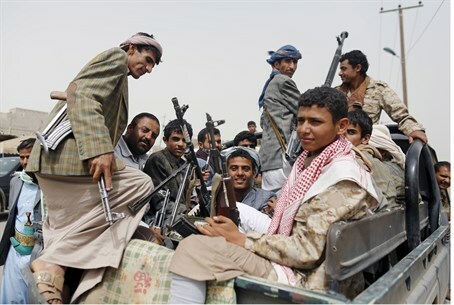 Iran has been shipping weapons to Yemen's Houthi rebels since at least 2009, according to a confidential UN report seen by AFP, which reported about it on Friday. The report indicates that Tehran's support for the rebels dates back to the early years of the Shiite militia's insurgency. The report, by a panel of experts, was presented to the Security Council's Iran sanctions committee last week as the United Nations seeks to broker an end to the Saudi-led air campaign in Yemen and a return to peace talks. The panel of experts reported on the findings of an investigation into the 2013 seizure by Yemeni authorities of an Iranian ship, the Jihan, that was carrying weapons. The information collected by the experts "suggests that the Jihan case follows a pattern of arms shipments to Yemen by sea that can be traced back to at least 2009," said the report seen by AFP. One instance saw an Iranian fishing vessel attempt to secretly ship hundreds of anti-tank and anti-helicopter rockets to the rebels. "The analysis further suggests that the Islamic Republic of Iran was the origin of these shipments and that the intended recipients were the Houthis in Yemen or possibly in some cases further recipients in neighboring countries," the report says, according to the news agency. "Current military Iranian support to Houthis in Yemen is consistent with patterns of arms transfers going back to more than five years to date," it adds. Iran, however, denies accusations that it is meddling in Yemen and instead accuses Saudi Arabia of carrying out a military "aggression" against the troubled country after it launched an air campaign on March 26. The experts' report details six other incidents involving Iranian ships, five of which are said to have been carrying weapons bound for Yemen, according to AFP. In one of the cases, the panel said it had received conflicting information about whether there were weapons on board the vessel. In an incident dating back to April 2009, the crew of an unnamed Iranian vessel loaded crates of weapons onto Yemeni boats in international waters which were then delivered in batches and taken to a farm in Yemen for use by the Houthis. And an Iranian fishing vessel was seized by Yemeni authorities in February 2011 carrying 900 Iranian-made anti-tank and anti-helicopter rockets intended for the rebels, the report said. Iran is prohibited from selling weapons under a UN resolution adopted in 2007 that also instructs all countries to take action to prevent any arms flow from Iran.